Makes for a quick tidy repair. Tying knots in the string works, but doesn't always make a good connection with the metal strands. The brass ferrule helps eliminate that problem. Fix old and/or broken electric netting. Place the replacement conductor next to the broken end of a horizontal conductor in the netting. Using a pliers, crimp the ferrule together so that both conductor pieces are cinched tightly by the ferrule. Do the same to the other end. The ferrule is metal and should both physically and electrically connect the broken pieces. Recommended: 5 out of 6 said they would recommend this product to a friend. I wish they were bigger so as to secure the notch of the netting better. Not big enough and they don't work well. Even pinching two sections together as hard as possible they release the netting closest to the exit. Nice strong ferrules that will withstand the goats! 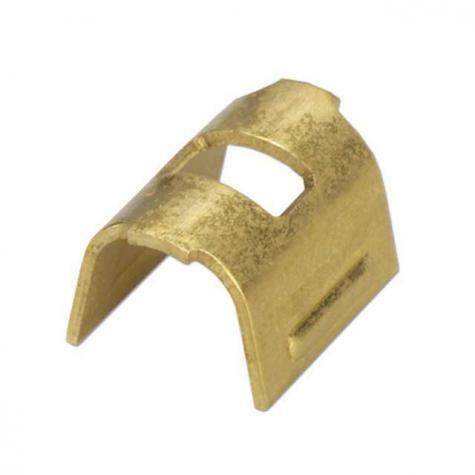 These ferrules make fence repair easy and long lasting. I was first introduced to them in the fence repair kits, but now definitely recommend buying them in bulk. Super easy and efficient to use for fixing mesh fences. Before we even got our fence turned on for the first time, our sneaky dog had chewed several holes in it in a few different places. These clamps got it working again in no time! Definitely worth buying in bulk.